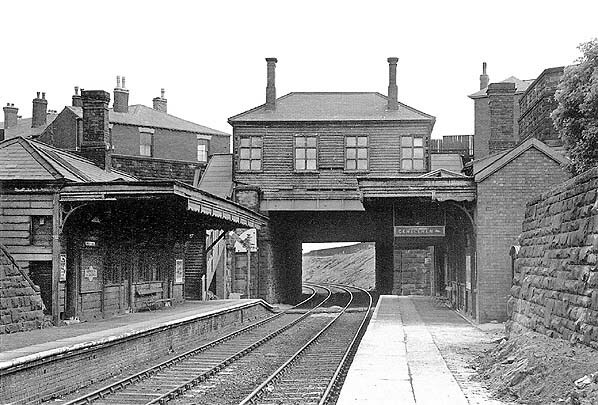 Notes: Rumworth & Daubhill station was part of the 10½-mile Kenyon Junction – Bolton Great Moor Street line. It was on deviation from the original line that opened on 2 February 1885. 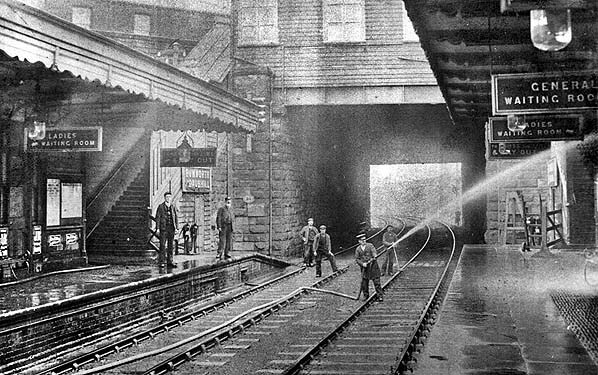 The original line though Daubhill had been built by the Bolton & Leigh Railway (B&L) and it was the first public railway to open in Lancashire. The single-track line was authorised on 31 March 1825 and ran from the important manufacturing town of Bolton to the Leigh Branch of the Leeds & Liverpool Canal at Leigh and Bedford. Engineered by George Stephenson the line opened on 28 August 1828 for goods services only. On 5 May 1826 the Liverpool & Manchester Railway (L&M) was authorised and its route passed through Kenyon which was only 2½ miles south of Leigh. Both the L&M and the B&L was keen to have a connection between the two lines and to bring this about a separate company, the Kenyon & Leigh Junction Railway (K&LJR) was created. A 2½-mile connecting line was authorised on 14 May 1829. The L&M opened to passengers on 15 September 1830 and was an immediate success. Less than a year later on 2 June 1831 the K&LJR opened. Regular passenger services were run on the line from 13 June 1831. The line became part of the London & North Western Railway (LNWR) on 16 July 1846. 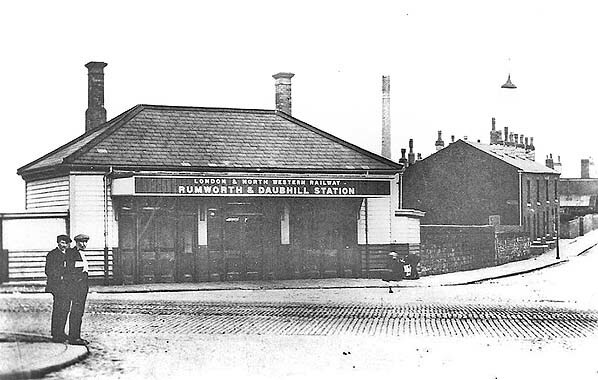 A passenger station was opened at Daubhill in 1846 on the original line. To the east of the 1846 station there was a steep descending incline. In just over a mile the line fell by 119ft and when it had opened the incline was rope-worked by a 20hp stationary steam engine. Although use of locomotives on the incline had started by the 1850s it was still a formidable obstacle, and as part of a package of improvement works authorised in 1878 the LNWR decided to ease it through the creation of a deviation. The works also included doubling of the original route. 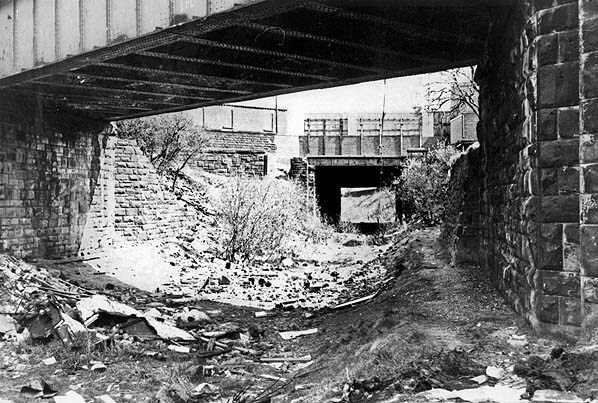 The deviated line ran to the south of the original route and passed under St Helens Road (now A579). A new station was required and it was located on the west side of the road in a cutting. At street level straddling the line was a single-storey building, with a hipped roof and two tall chimneystacks, in which the booking office was situated. Covered steps led down from each side of the booking office to the platforms. There were single-storey buildings on each platform. On the up (south) platform the building was of brick under a pitched roof and a cantilevered awning stretched its full length, its valance decorated with an attractive pattern of curves. Photographic evidence suggests that the building of similar size on the down platform was all, or partly, of timber construction and its roof was hipped. It carried an awning of similar length and style to the building on the opposite platform. The goods facilities at Daubhill were on the original line just east of the 1846 station. The December 1895 timetable showed eight up and ten down weekday services. There was no service on Sunday. On 1 January 1923 the LNWR was merged with other companies to form the London Midland & Scottish Railway (LMS). The company installed its distinctive ‘Hawkseye’ nameboards. The LMS summer timetable for 1932 showed 15 up and 16 down Monday-to-Friday trains. On Saturday there was an extra up train. During the Second World War passenger services were reduced and they never returned to their 1930s levels. The LMS summer timetable for 1947 showed seven up and eight down trains on Monday-to-Friday as seen in the table below. On Saturday there were two extra up and one extra down train. On 1 January 1948 the line became part of British Railways [London Midland Region] (BR[LMR]). The summer 1949 timetable showed 5 up and 6 down trains Monday-to-Friday. On Saturdays there were 8 up and 11 down trains. BR[LMR] Rumworth & Daubhill closed completely on 3 March 1952. Passenger services between Kenyon Junction and Bolton Great Moor Street contined to pass through the station until they were withdrawn on 29 March 1954. 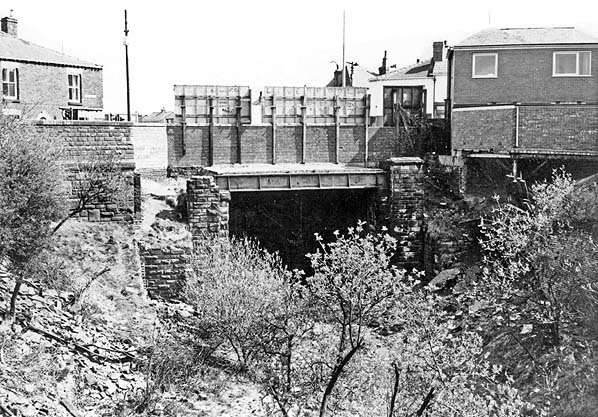 On 17 June 1963 the line between Pennington and Howe Bridge North Junction closed completely; thereafter trains could reach Bolton or the Daubhill goods facilities only via the Wigan – Eccles line. The sidings on the original line at Daubhill closed on 11 April 1964. On 16 October 1967 the line through Rumworth & Daubhill closed completely (between a point just to the north of Atherton Bag Lane and Bolton Crook Street). It was lifted shorty after and the station was demolished. The cutting in which the passenger station had stood was infilled in the 1980s. A Lancashire Triangle Part 2 - D J Sweeney, Triangle Publishing 1997. A Regional History of the Railways of Great Britain - Volume 10 The North West - Geoffrey O Holt, David & Charles 1986. Forgotten Railways - North West England - John Marshall, David & Charles 1981. Railway Passenger Stations in Great Britain - A Chronology, by M Quick, RCHS 2009. Looking east along the down platform at Rumworth & Daubhill station in the LNWR era. Staff appear to be using fire hoses to clean the up platform buildings. The original alignment is still clearly shown just north of the later station on this 1947 map. Rumworth & Daubhill station shown on a 25-inch scale map from 1892. By 1936 there had much development around Rumsworth & Daubhill station as shown on this 25-inch scale map. The Rumworth & Daubhill booking office looking west in the early part of the Twentieth Century. 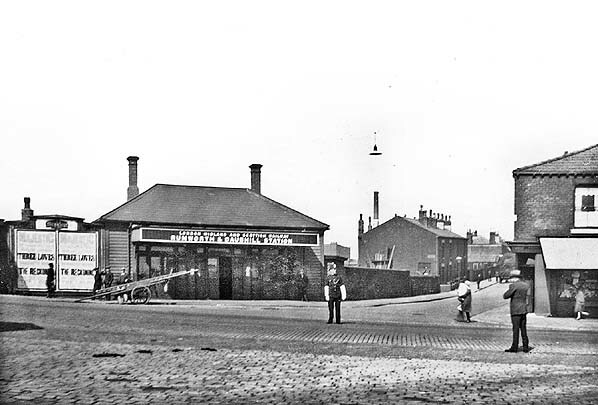 Looking west at Rumworth & Dabhill station from the street in 1925. Looking south-east along the down platform at Rumworth & Daubhill station towards Bolton in 1952. 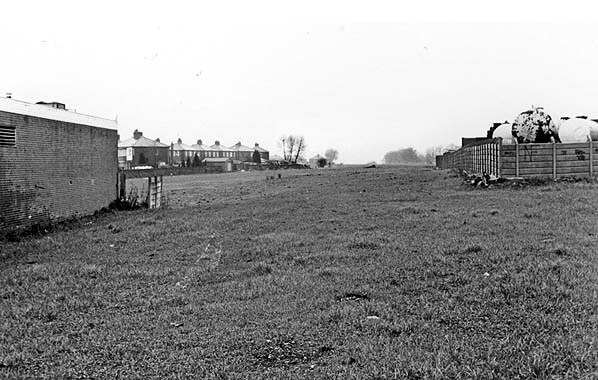 The site of Rumworth & Daubhill station looking south-east in April 1978. The photo was taken a little further to the west than the 1952 view above. booking office in April 1978. A view looking west at the site of Rumworth & Daubhill station in 1990. 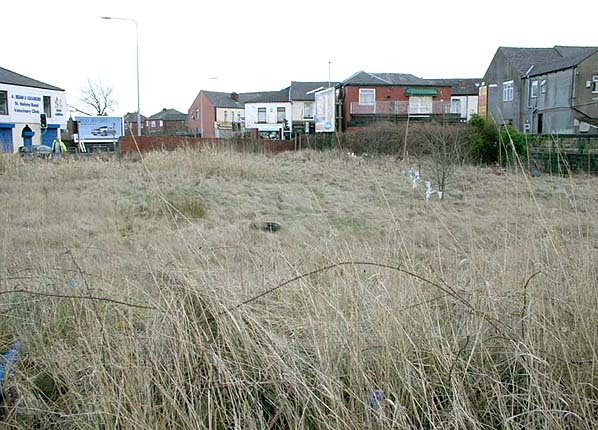 The site of Rumworth & Daubhill station looking south-east in May 2006. The station was in cutting that had been filled in to ground level.